Sometimes we make mistakes. We do our homework wrong, or we forget people’s names. But most of the time, our mistakes aren’t very serious. It’s important to remember not to cry over spilt milk. 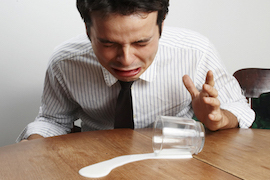 Crying over spilt milk means making a big deal out of something that is not very important. For example, if Steve gets mad at himself because he burned his food, he is crying over spilt milk. He can just make some more food. Or, if Sheila is upset because her friend hasn’t called her back, she should remember not to cry over spilt milk. 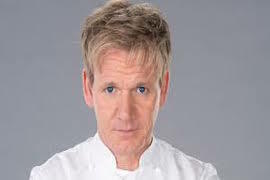 Celebrity chef Gordon Ramsay says he doesn’t have time to cry over spilt milk. He doesn’t worry about small problems because he prefers to spend his time thinking about more important things. Do you ever cry over spilt milk? Regret things which can not be changed. Not crying over what cannot be undone. Heheheheheh !!! Dear Shoba thanks for the feedback , Ok I am ready to send you the money,If your daughter does such cases. But i am sure she is too smart and educated will never does . Cuz she is your daughter ! We have the same idiom here in Arabic! I think that is in in human nature to cry over the spilt milk. I say that from my corner of view. But we all know we can’t change anything after somting happen. I was grinning when I read your “kidding” comment. What you say is true, if my daughter breaks my Tv or burns my new clothes I would feel sad and cry over spilt milk. Then I’ll wipe away my tears and ask my dear friend Asef in Afghanistan to send me some money for giving such ideas to my daughter. Gordon Ramsey doesn’t cry over spilt milk?!!! For every mistake made in cooking, he’ll just shower with a barrage of indecent words in a very loud fashion and gets going to his meals again. Just a momentary letting the steam out maybe doesn’t count as crying over spilt milk. I think, this guy doesn’t cry over spilt milk in a better way ;) He just sings! That’s a good attitude! I do not not crying over spilt milk. My daughter spills milk almost every day. I swear I never cry over it. I just mop it. LOL. Aha, Maher20000, you were not talking about me, were you? This is quiet interesting to me but i am wondering why i can not stop crying over spilt milk, As much as i try my best not to cry over spilt milk but i cant ! Oh sheet , I think its too difficult that your beloved one left you and touched your heart, offcourse we get upset and crying over spilt milk …..........Dont you friends ? But for some cases we can do and for some we cant . Once I lost my mobile that time I cried over split milk but my father told me that I didn’t cry over split milk I had to do necessory things ahead and managed my situation. That time, I leant why we don’t worry about unfortunate event’s which have already happned and which cannot be changed. I don’t like crying over split milk. The problem is: some people spill the milk many times every day. I usually cry over spilt over milk, meaning getting worried with no particular reason. Although I try to work on my traits. Like Gordon Ramsay, I don’t have time to cry over spilt milk. When I make a mistake I just try not to repeat it and I forget it.